We’ll take a look at why many roasters (including us) favour blends and why. At the East London Coffee Company we try and satisfy the needs of a broad group of coffee lovers who visit upmarket restaurants and are somewhat passionate about this wonderful brew. A good coffee should taste good and present a well rounded and interesting flavour together with a smooth balance between sweetness; acidity with perhaps just a hint of bitterness. This is what we target in our Cutman & Hawk Signature Blends and this is what we believe will meet the exacting standards of our clients. This said, many beans do not go well together. Some stronger South American varieties might well overpower the more delicate and fruity flavours of a Kenyan, so there is quite an art involved in designing a good blend. Your roaster might be compared to a chef who mixes many different ingredients to create the perfect dish. Most of these ingredients would be wasted on their own, some even unpleasant, but they combine well as a unit to deliver what might be an exceptional dish. This approach has worked well in the wine industry and also with some of the finest Scotch whiskies, where many varietals are successfully blended together to produce final products of a far better quality than the individual ingredients themselves. Single origin coffees are coffees that come from one single, traceable origin, be this an individual farm or a small region. This said, even if the direct source is known, it is unlikely a roaster will offer this as a stand alone coffee unless this is of a superior quality, often referred to as a speciality coffee. These are usually quite rare, naturally grown coffee beans that become available in small batches or microlots from time to time. It also doesn’t mean that they are necessarily better for your daily brew than you favourite blend, but they are sure you offer you a taste experience due to their individuality as each is sure to have stand-alone, unique flavour with different characteristics. Some might argue that a single origin might only have one or perhaps two of the characteristics required in a really good coffee. Many coffee lovers (particularly those who are used to very dark roasts) will be quite surprised and often disappointed in the lack of body or mouth feel of a single origin coffee. I will go for a blend for daily use but there is nothing quite as pleasurable as a nee coffee experience. Our roaster explains, “I tasted an Ethiopian Yirgacheffe the other day with two friends. Coffee from this region is surely one of the best in the world, tea-like delicacy with floral and citrus aroma and taste, awesome!.” A robust blend such as our Cutman & Hawk Signature Espresso Blend would fare better when used as a base for milk based brews such as cappuccino and other popular drinks, but the Cutman & Hawk Roaster Reserve Range is ideal if you are after a taste experience. To get the most out of a single origin, beans are best roasted to a medium roast and enjoyed either as a straight coffee or perhaps an espresso. As soon as you add anything, or over-roast, much of the delicate flavours are hidden. 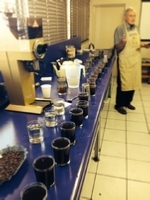 Read about each individual coffee growing region and the characteristics of regional coffee.